David's new-to-the-farm, 1950s-era greenhouse shelters seedlings of vegetables that are destined for Honeywood. Field stone, a k a "dirt rock," walls support the greenhouse, salvaged from Lexington. We're on the late-winter weather rollercoaster, and there's no turning back now! Going from a cold deep winter to a very wet February, we've not had our pick of days to work the soil. However, a single recent afternoon with conditions in the garden just barely dry enough allowed us time to sow the earliest crops. And then, whoosh, down came the rain to water in the seeds. Thankfully the creek banks have held the flash-flood waters, and seeds and soil have stayed in place. We were lucky during recent March storms to be in a pocket of less heavy rainfall in our Crooked Creek watershed. No damage. It’s just been very soggy out there. And cold. And snowy at turns. A lionlike entire first half of March! Surviving the cold winter wasn't easy for our tiny titans in the garden, but fall-sown mache and claytonia are greening up, and ready to pick and deliver to Honeywood. Work is underway with sowing in flats in our newly erected and enclosed greenhouse. Salvaged from a Lexington backyard, our 1950s-era aluminum Lord and Burnham growing space is filling up fast with seedlings. Eventually it will overflow, and plants will be set out to harden off in their pots, then be transplanted, well before the last frost around May 1. At that point, for weeks, we'll be going at top speed, seemingly out of control. (Anyone remember The Beast at Kings Island?) Spring is such a rush. We've set new harvest goals for 2018 based on the popularity of various veggies served in Honeywood's first year. Chef Josh pointed out how fast certain dishes flew out of the kitchen, so from broccoli to butternut squash, we want to grow the main ingredients for those. We'll also tweak the mix of greens for salads, bump up the production of spuds, and throw in some surprises, at Josh's request, from spring through fall, and into next winter. Expectations run high as grass greens and birds sing. Woodcocks buzz in the hills, and the spring peepers' chorus rings out from the pond. We've hopped on board, strapped ourselves in. Let's go! Chef Josh has been using Three Springs Farm's mache, left, and claytonia throughout the winter. The tender claytonia — a mild, sweet green — was used as a garnish for a rabbit dish prepared by Ouita Michel, Chef Josh and Chef Tyler McNabb from Holly Hill Inn for a James Beard Foundation dinner in New York City Feb. 27. Tobacco cotton helps protect Three Springs Farm's claytonia crop. A pleasant day in February allows for harvesting a bag or two to take to Honeywood. 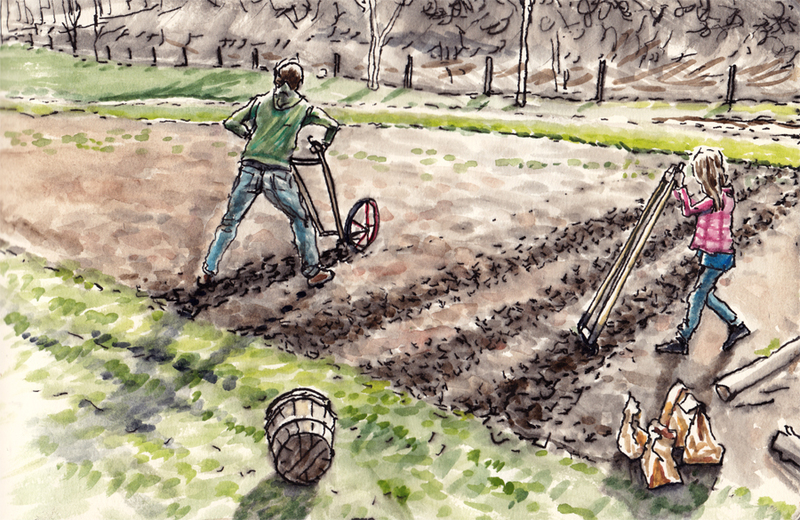 David's wife, Arwen Donahue, shares one of her illustrations of early spring on the farm, with her and daughter, Phoebe, planting a garden.